Publication History: Originally published in the Proceedings of the 13th International Conference on Outdoor Recreation and Education. Citation: Watters, R. (1999). The proposed expanded class I system of rating rivers. In Harwell, R. & Emmons, K. (Eds.). Proceedings of the 13th International Conference on Outdoor Recreation and Education (pp. 198-201). Boulder, CO: The Association of Outdoor Recreation and Education. The International Whitewater Scale with which everyone is familiar has a fairly straightforward definition for class I water. For experienced whitewater boaters, it works just fine, but for those who are largely class I boaters, it isn't as workable as it first seems. Anyone who has run a lot of class I water knows that there is much variation in what is covered by the class I designation. For those of us in the outdoor education field, it is nice to know just how difficult that class I river is. For example, a kayak instructor taking out a group of beginning kayakers for the first time will want to avoid a swift moving, twisting and turning river with lots of overhanging trees. 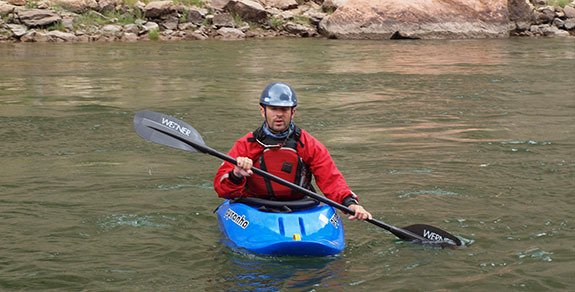 A prudent instructor will start out with something slow and easy going so that all the participants have a chance to get the feel of their kayaks before progressing on. It is particularly helpful for open canoeists to know the difficulty of a class I river. The great majority of river canoeists use and are happiest on class I water. Most of them would rather keep their canoe upright, particularly if it’s a cold day. While it may be fun for some, a good many class I canoeists opt for staying upright and not having to fish out their friends and spouses and what is left of their water-sogged gear. For safety reasons, one particular group of boaters need to have a clear cut idea of the difficulty of class I water: families. Families with very young children need to choose their rivers carefully. Some class I rivers are simply too dangerous for children. In this paper, I am proposing a system of rating class I water which affords instructors, canoeists and families a better idea of what they might be getting themselves into. To begin, let's start out by a quick review of the International Scale of River Difficulty. The scale is universally accepted by river runners and outdoor education and ranges from class I to class VI. Class I is easy water and class VI is extremely difficult and dangerous. It is the last two phrases (“risk to swimming is slight; self rescue is easy”) where the trouble lies. After running nearly 100 different easy river stretches in Idaho (Daly & Watters, 1999), I have come to the conclusion that no matter how you look at it, some class I rivers simply don't meet the "little training" or "risk to swimming is slight" tests. Some additional tweaking of class I is needed for boaters that are not whitewater hardened. To illustrate what I mean, let's look at two examples. Two examples in Idaho help illustrate the problem with relying on the class I system as it is presently constructed. The first example is the Big Springs National Waterway Trail. A beautiful paddle trip among meadows and forests, the Big Springs run is located just west of Yellowstone National Park. The second example, is the cottonwood fringed Boise River just below the city of Boise. Both are rated class I. The first trip starts some distance below Big Springs, a huge springs from which the Henry's Fork of the Snake River starts. Its gin-clear water flows with barely a discernible current. It's definitely easy, one can do it with little training, and it is a good trip for families. But the Boise River is another story. As the Boise goes around the south side of the several-mile-long Eagle Island, it is swift and flows through a narrow, twisting river channel with lots of overhanging trees. Eddies are small and hard to catch and you can come around a corner and suddenly be faced with a tree all the way across the river. Is this stretch of the Boise River easy? No. Can you do this stretch with little training? Once again, the answer is no. In fact, it takes good boating skills and a fair amount of experience. Moreover, sometimes rivers like the Boise take more finesse, knowledge and training than some class II rivers. Yet no one would ever rate the Boise River as class II. If you are a beginner, or if you are going out with your family or friends, the class I rating fails to tell you what you are really getting into. To help provide a better gauge of the difficulty of this type of water, I am suggesting that outdoor educators use an expanded class I system. Instead of devising something completely new which might be confusing, I propose staying with the international scale but expand it slightly. For those who are comfortable with the international scale, it's there, but those who want a finer way of distinguishing between rivers, it's there too. Class I (1.0) Flat, lake-like water. No current or very slow moving current. One can easily paddle upstream and downstream. This the safest water for families and children. Since the water is slow moving, downriver trips against strong winds, may be taxing. Class I+ (1.3) Moving water with mini-rapids. 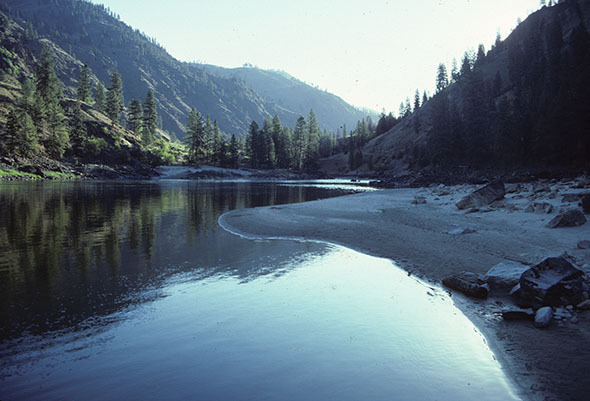 Small, mini-rapids may occur in swift areas of the river-or where the river slides down gravel bars. The river may have some swift corners with overhanging trees on the outside of bends. Rocks and boulders may be present which need to be avoided, but the current is gentle and not strong enough to cause a boat to get wrapped or broached. Class I+ (1.4) Swift water with mini-rapids, small waves and obstructions. The river may bend sharply and the current on the outside of bends is more forceful. 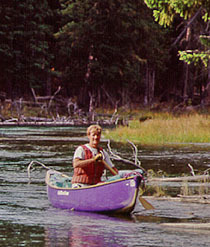 Such rivers may have narrow channels with long stretches of overhanging trees and brush in which a boat can get hung up and flipped over. Canoeists and kayakers should have a good understanding of how to lean boats while in the current, or while turning in and out of eddies, or if accidentally pushed up against an obstruction. Boaters should be very comfortable maneuvering the boat through rocks and have the ability to catch small eddies. A sureness of technique is needed to stop quickly if fences, trees or diversions are encountered. Class I+ (1.5) Rapid water with small rapids, waves and obstructions. The river may be very narrow and have many sharp turns and long stretches of overhanging trees and brush. In higher flows, trees, log jams and other strainers are dangerous. Some waves may be present which, if run sideways, can swamp a canoe. 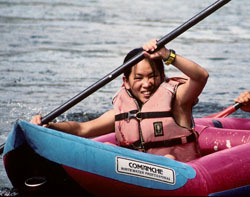 Improper leans in a canoe or kayak can cause a capsize. Boaters must have the ability to read the water, anticipate future moves and react quickly. A well-practiced, reliable eddy turn is a must. With the expanded class I scale, outdoor educators have a much better way of distinguishing between the variations found in flat but moving water. They can better chose locations for instructional trips and make more accurate comparisons between rivers. Canoeists will find it particularly helpful. With better accuracy built into the rating system, they can avoid those unpleasant experiences which can spoil an outing. And finally, it provides families with a better gage on river difficulty and helps keep children safe. Belknap, L., Walbridge, C., Thornton, M. & Browers, R. (1998). Safety code of American Whitewater. Margaretville, NY: American Whitewater. 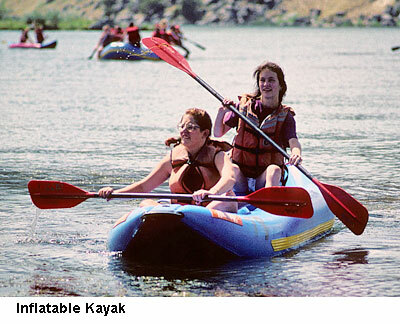 Daly, K. & Watters, R. (1999) Kath and Ron’s guide to Idaho Paddling: Flatwater and easy whitewater trips. Pocatello: Great Rift Press.